As we're all waiting for the mega fight of the millenium - The Mayweather-Pacquiao Fight, the current WBA Welterweight Champion of the world, undefeated American boxer said in a statement that he'll be knocking out our beloved Filipino Champ Manny 'Pacman' Pacquiao in the 5th round. Mayweather said in an interview, "Look, if Marquez knocked Pacquiao out like that in the sixth, then I guarantee I’ll have him out by the fifth because I beat Marquez like a slave." The said loss of Manny was his fight against Juan Manuel Márquez mid December of 2012. Pacquiao was knocked down by Marquez on the 6th round which made the latter winner that day. But before the said loss, Pacquiao already won twice against Marquez year 2008 at 2011. It might be true that Mayweather has defeated Marquez in their match last 2009 but the latter was never knocked down on that fight, Mayweather just one after their 12 rounds fight via unanimous decision. Now, after six years of screaming to the world that he wants to fight Mayweather, Pacquiao can now prove what he once told thru Skip Bayless and Stephen A. Smith that he can beat Mayweather. Pacman said, "I know in my heart and my mind I can beat him. I was more worried when I fought Oscar De La Hoya and Miguel Cotto than this fight. That's in my heart." 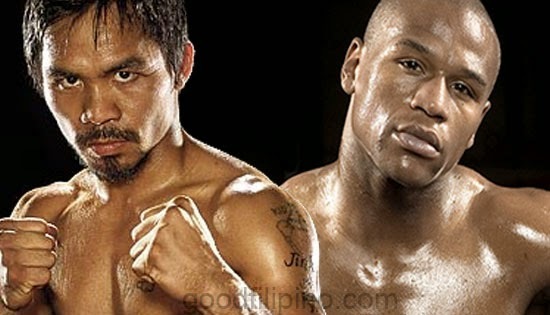 Comments or suggestions about "Mayweather-Pacquiao Fight: Mayweather Says He'll Knockout Pacquiao in 5 Rounds" is important to us, you may share it by using the comment box below.